FREE MONTHS OF PRO · CASH PRIZES · GAMESALAD 2014 GAME JAM - ROUND TWO! — Welcome to the GameSalad forum! FREE MONTHS OF PRO · CASH PRIZES · GAMESALAD 2014 GAME JAM - ROUND TWO! The deadline for submissions to this competition is November 24, 2014. Every game submitted gets 1 free month of PRO membership. Every developer that submits one or more games earns a single entry into the sweepstakes. The GameSalad Game Jam 2014 is a series of rapid game development competitions using the GameSalad Creator that culminate in cash and prizes, promotion on GameSalad Arcade and Amazon, and the ultimate bragging rights in GameSalad game development. This is the second of two competitions, each with a different theme, with two weeks to develop your game and submit your entry. The top three games from both Game Jam competitions will be selected by GameSalad staff to receive a year of GameSalad PRO membership, and additional promotion for the game and the developer. Additionally, 6 winners will be drawn at random to receive these fabulous prizes! You only have two weeks, so focus on replay value and fun. Think "cartoon short" rather than "epic movie." Each game however must be fully functional, contain at least one complete level, and be otherwise polished and free of bugs. All games submitted need to be designed for and tested on touch devices as well as desktop browsers. *GameSalad will publish select games on Amazon for promotional purposes, with developers retaining all IP rights. Click here for full rules. 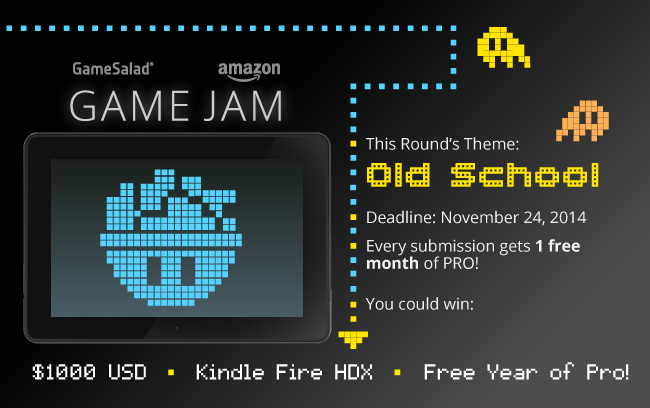 Game Jam Theme #2: "Old School"
Publish your game to GameSalad Arcade. Make sure your game’s Visibility is set to Public Game and you’ve filled out all necessary fields. Double check the Subject Matter section to make sure everything is correct. Once your game is ready, on the Incentives tab of your publishing portfolio game for the page click the “THIS GAME IS READY TO JAM” button for the appropriate Game Jam. Each game can only be entered into a single Game Jam. When will we receive the 1 free month of pro for our submission? Oh No !! This will be a challenge I don't even know how to make old school graphics! i've been trying to convert my round 1 entry into a full iOS game. I might have to take a break this week and see what I can come up with for this! Who has won the first round? Disappointed to see that the distribution of prizes hasn't changed this round. It just isn't fair that a randomly chosen winner receives a better prize than the person who actually took the time and effort to make a great game that actually fits the theme (considering that all of the sweepstakes prizes are worth more than the year of pro). I'm glad you guys at least changed it so that each person can only have one entry in the sweepstakes regardless of how many games they submitted. That's a start. But honestly Gamesalad--what were you thinking? At least tell me that if someone submits one of the top three games then he or she isn't excluded from also being one of the randomly drawn winners as well? I recall numerous users having a problem with this system in the first round, and someone (can't remember who) provided a perfectly logical solution. So my question is, did the people in charge of the jam at Gamesalad not see the complaints (the single entry aspect was changed, so I assume the prize comments must have been read as well), or were they simply ignored? Either way, it's simply unacceptable. Frankly, I was surprised and discouraged at the lack of communication on Gamesalad's part. Again, not trying to be rude or anything. But I know I'm not the only one confused here. someone (can't remember who) provided a perfectly logical solution. That would probably be me. I brought up the point at the GameSalad meet-up earlier this month as well, and the GS team explained it has to be this way because of some legal issues (in a shortcut, winning money by selection or by sweepstake created completely different legal circumstances). While this is still very unfortunate and I wish it could be otherwise, it isn't the GameSalad team's fault and nothing can really be done about it. Have to agree with @Rainbros choosing a random winner puts me off entering so i will pass why spend a week or so making a nice game and get beat by someone thats put 30 minutes or less into it? Free months pro is also cool but again a lot of people are just going to submit any old crap just for the months pro. Have to agree with Rainbros choosing a random winner puts me off entering so i will pass why spend a week or so making a nice game and get beat by someone thats put 30 minutes or less into it? I am confused. Because the image says Every submission gets a free month of PRO. Which one is real? Every (approved - i.e. it has to be at least vaguely a game) submission gets a free month. Then there is a sweepstakes that picks six winners of cash/Kindles. And then there are (there?) winners of the "best games", that get a year of Pro. Love the retro theme! Will give this a shot! Do you know if you can sell the game? or is it the intention to give a free demo game? And when you download the game you can, on the same moment, also download the game on the other Pro platforms? Thanks for possible information. I'm a noob, but when I choose the kindle fire platform in gamesalad the display size is 1,024 x 580, but newer kindles have higher Rez. What size should I work to? can we use templates in the marketplace? Do we have to create the game in the two weeks period? Or can we enter a game we already made that happens to fit the theme? Also, the rules state that the odds will be based on the number of entries. Will there be a place where people can publically view the number of entries? Or will that not be disclosed. The rules state the odds are not based on the number of entries. My assumption is that if 100 people enter, your chances are 1 in 100. If 1000 people enter, they're 1 in 1000. You can get a rough idea of the number of entries by looking at the arcade. Each entry has to be in the arcade and publicly viewable. I thought the rules (stated here) said "The odds of winning depend on the number of eligible entries received." What they mean by it, is that if 2000 people enter theres a 1 in 2000 chance of winning. Their point is they cannot predict the chance of you winning with your single entry. Perhaps the confusion is this: The number of times YOU enter won't affect your odds of winning. The total number of PEOPLE who enter WILL affect your chance of winning. The more people who enter, the lower your chance.